The Tata Altroz hatchback made a world debut at the 2019 Geneva Motor Show. The new hatchback was expected to be launched sometime this year in India. 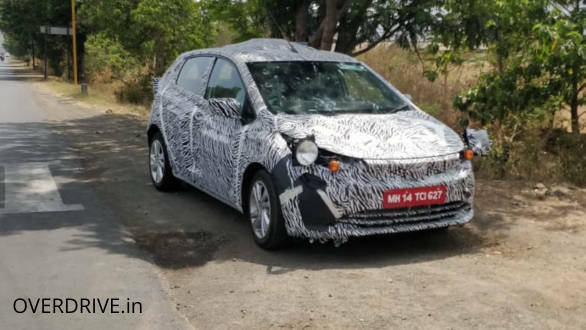 Soon after the world debut, OVERDRIVE spotted a test mule of the Tata Altroz doing rounds on the outskirts of Pune, India. This lets us believe that the manufacturer is giving the production-ready hatchback some final touches to Indianise the Altroz. 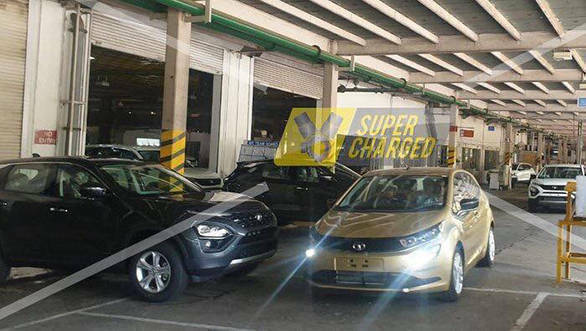 This time around, a production-ready Tata Altroz has been spotted sans its cloak at the manufacturer's plant. The spotted hatchback is painted in a shade of yellow and gets powder coated alloy wheels unlike the chrome or gloss finished alloy wheels like its rivals. The styling and the design cues are similar to the car showcased at the 2019 Geneva Motor Show. The drivetrains are expected to be shared with the Tata Nexon crossover. The Altroz might be offered in India with BSVI compliant 1.2-litre turbocharged petrol and 1.5-litre turbocharged diesel engines, both producing about 100PS. A possibility of an Altroz EV cannot be ruled out as the manufacturer showcased an EV hatchback at Geneva. The Altroz is expected to be launched in the second quarter of 2019 and will be priced in the same ballpark as its rivals - Hyundai Elite i20, Maruti Suzuki Baleno and Volkswagen Polo.